Billions of kids never had a chance to hear about God and study the Bible in its entirety as structured education. Our hope is to provide such education via this "virtual" Sunday School. 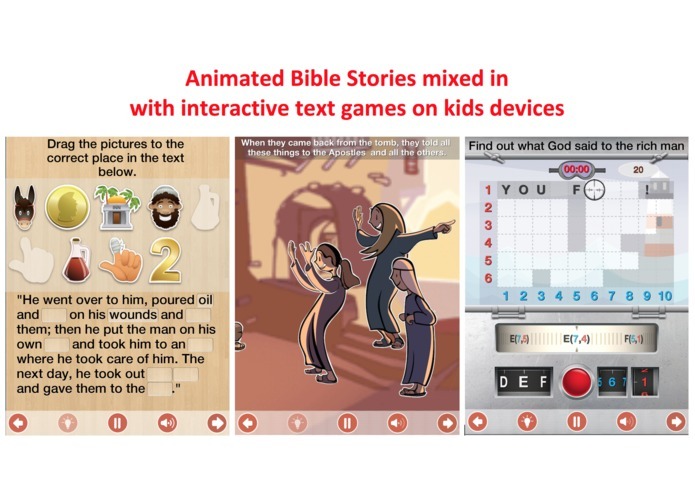 1) kids can use iOS/Android app to listen to the animated stories and play text-based interactive games to study Bible topic by topic 2) Allows teachers to add their custom lessons in the online Editor and push it to their kids devices or to the world. 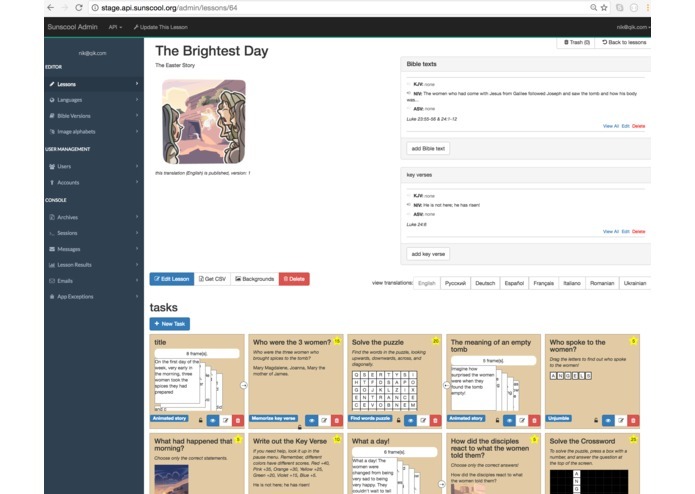 During C4TK hackathon, we wanted to create a completely new lesson with Carmen who has never used our app and our Editor before. She and Camil managed to add this lesson in less than 1 day, and do it all in Spanish - this is our first lesson in Spanish!! Also, we added ability to add animated Spine objects to a timeline of the animated story, to start their animation in the proper time of the voiceover audio. App is built with Unity Backend is Ruby on Rails. Online Editor is Coffescript. Hackathon feature involved modifications on all 3 domains - app, backend and front-end. Usability & bugs of the Editor for teachers and App for kids. 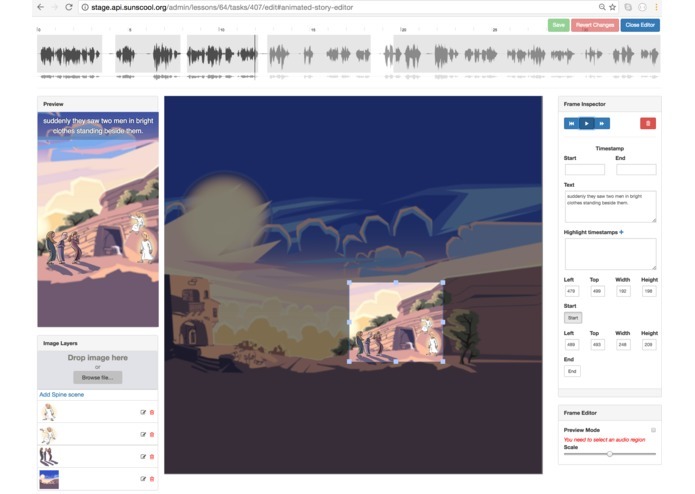 Design for placing multiple animation timeline tracks along the audio track. 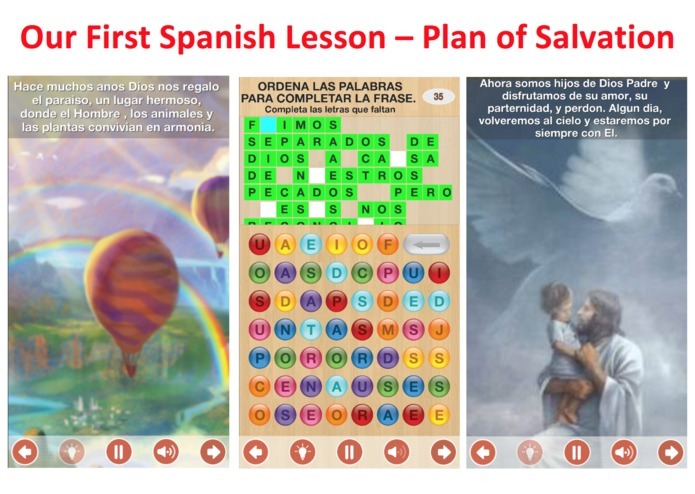 Carmen and Camil created completely new lesson in Spanish, using Editor, telling about Salvation Plan. 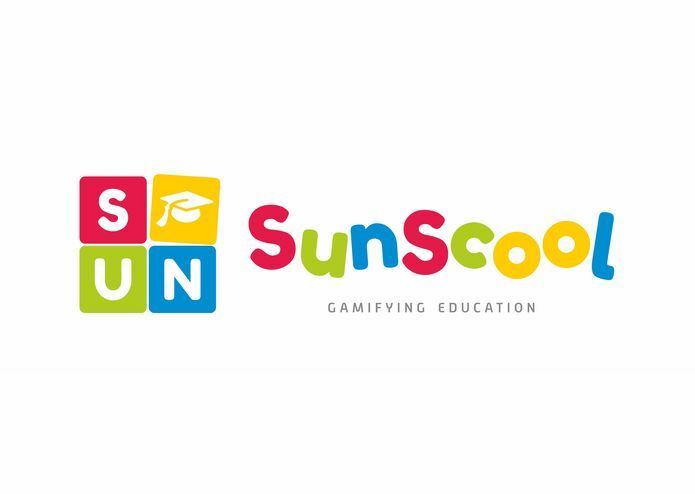 We have a service that allows teachers to independently create lessons for the targeted group of kids and communicate the Message in the most relevant way for those kids/teens. Our Editor requires a lot more work to improve it's usability for teachers. Fix bugs in the Editor & add tests for it. Build more new lessons and improve UX in the app and Editor.